The PDF document format is increasingly being used, including for conference CDs. 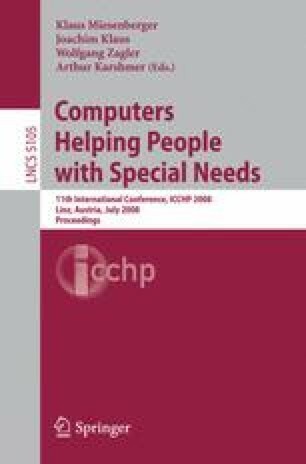 This paper discusses the process of producing an accessible CD based on PDF documents for a small assistive technology conference, CVHI 07. It also analyses the accessibility features of the resulting PDF documents and the results of a survey of the conference authors on their experiences of (trying to) produce accessible PDF documents. The paper is introduced by brief discussions of PDF accessibility and of the results of surveys of the experiences of blind and visually impaired people of using PDF documents and the accessibility of PDF documents produced by UK universities. It concludes with a number of recommendations for conference organisers producing accessible CDs, as well as suggestions for future work.